As the world connects more through advancements in science and technology, conversations on the prevalence of race and racism are also growing. In the public imagination, ideas like post-racialism are gaining popularity as a possible solution to the question: what will/should our future look like? Attempts to show what an ideal future could be like take form in various stories, TV shows, and films. Yet, none breathe more life into a post-racial world than Star Trek. A multicultural cast with diverse backgrounds, the Enterprise crew serves as a model for a future in which the human family transcends Earth and infiltrates space. In creating this new world, storylines are constructed around race and relationships as a means to engage the predominantly American audience, which is intimately familiar with race relations. As a result, characters come to embody different understandings of race and its intersecting realities with gender, class and sexuality. Post-racialism specifically, promotes the desire for race to go unrecognized, for individuals to be blind to color. Star Trek aims to depict a future where all people are present, but not represented, where race is synonymous with one’s planet of origin and where there are no limitations to interracial and intraracial relationships. Interracial relationships, particularly between black women and white men, are central to the post-racial discussion as a means to show what progress looks like in science fiction narratives. The original Star Trek series is often celebrated for its groundbreaking portrayal of interracial intimacy. In the 1968 episode, “Plato’s Stepchildren” Captain James T. Kirk and Lieutenant Nyota Uhura have the first on screen mouth-to-mouth interracial kiss. At the time, this bold statement was considered a critical success for civil rights efforts because of its surprising general audience acceptance. Uhura’s character, played by Nichelle Nichols, was a core member of Starfleet and a central figure in the show, very few black women on television held such a position. Because of the historically limited access black women had to positions of power, Uhura’s role was not only significant, but in a way became a symbol for what could be possible. The kiss between Kirk and Uhura however, was arguably viewed as “acceptable” because of the episode’s storyline. Trapped on a planet where advanced humanoids use telekinesis to manipulate Kirk, Uhura, Spock and McCoy for entertainment purposes, Captain Kirk is forced to kiss Uhura through mind control. Although the kiss was real, its staging within fantasy, science fiction, and the backdrop of a post-racial future, blurred the lines of social acceptability. Whether the audience understood the social significance of the kiss as a shot against miscegenation laws or as an attempt to live up to a story, a future where technology and space are the final frontiers and race no longer exists, Uhura’s relative acceptability as a beautiful supportive crew member is largely what made her “worthy” of kissing. In the newest installment of the Star Trek franchise, Star Trek into Darkness (2013), little has changed in the mistreatment of Uhura’s character development. While the film impresses with its presentation of a futuristic Earth, reminding us why the series is considered a pioneer for technological ideas, design and engineering, Uhura’s depiction still disappoints. Her worthiness is still largely dependent on the triangle that exists between her, Spock and Kirk. It is nearly impossible for the current Uhura, played by Zöe Saldana, to possess dynamism. Uhura’s skills are briefly explored when she must communicate with a group of angry and war driven enemy Klingons. Overall, she remains stagnant in her role as girlfriend to Spock and friend to Captain Kirk. Uhura is depicted as a nurturer and in some scenes, the stereotypical nagging woman in her relationship strife with Spock. While Kirk’s character struggles to mature into his identity as leader of the Enterprise and Spock negotiates his biracial identity as half human and half Vulcan, Uhura shows no signs of evolution. She is either fighting for her position, as she did in the last Star Trek (2009) or trying to remain emotionally composed over Spock in silence. Even in light of the introduction of another woman character, Dr. Carol Marcus, a white woman, the audience learns more about this new figure than what we know about Uhura. The image of a young black girl, whose love for languages motivates her to work hard so she can one day become not only an expert, but also a leading Lieutenant in her field and a integral member of the Enterprise, is absent. Her family, her history, her narrative, is completely absent. Instead, it is replaced with the understanding that she is in love with a partner who cannot love her in the way that she loves him. Spock’s internal struggle to balance reason and emotion due to his biracial lineage renders him incapable of showing Uhura the love and nurturing she shows him. Although we might sympathize with Spock, Uhura not getting any love is a narrative black women are all too familiar with in relationships scripted for the screen. The polarization of Uhura’s character traps her in a voiceless space where she embodies a frontier that is already colonized. Controlling images of black womanhood aim to make oppression of black women acceptable and natural to everyday life. These images therefore filter into nearly all depictions and representations of black women on screen. 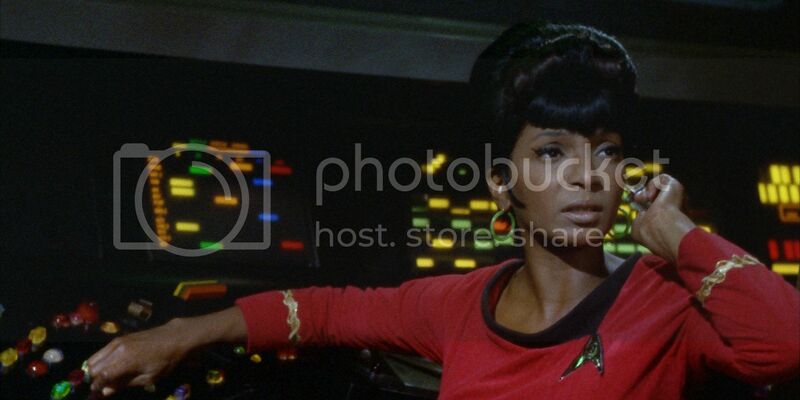 In a post-racial society, Uhura cannot exist independently of her white counterparts. Her personal story remains unknown to the audience as her role as romantic partner and nurturer to her colleagues solidifies. And herein lies a widely unexplored dynamic in interracial relationship plots written for TV and film: how might Uhura’s role reinforce a legacy in which black women are conduits for hidden white male sexual desire? Post-racial conversations aim to acknowledge race, but not to address structural racism. Post-racialism therefore, diminishes the prevalence of race and racism. Through this gaze, a true relationship involving a black woman and her partner can never materialize. Tania L. Balan-Gaubert is a Haitian American native of Chicago. She received her master’s degree in African American Studies from Columbia University and currently resides in Brooklyn. You can find her on Twitter and Instagram @tanialaure.